A common question people who have experienced a heart attack often have is whether—should they ever experience one again—they should chew and swallow an aspirin as soon as they call 911. But since a heart attack is a life-threatening event, how could taking a single aspirin do any good? A heart attack, also called myocardial infarction, is usually a form of acute coronary syndrome (ACS). ACS is triggered by the rupture of a plaque within a coronary artery. This plaque rupture causes a thrombus (blood clot) to form within the artery, leading to a blockage. The portion of the heart muscle being supplied by the artery then begins to die. The death of heart muscle is what defines a myocardial infarction. What this means is that, at the time you are having a heart attack, a big part of the problem is the growth of a blood clot within the affected artery. Formation of this blood clot depends to a large extent on the blood platelets, which are tiny blood cells whose job is to participate in blood clotting. It turns out that aspirin—even in small doses—can rapidly and powerfully inhibit the activity of the platelets, and therefore can inhibit the growth of the blood clot. Inhibiting the growth of the blood clot is critical if you're having a heart attack since maintaining at least some blood flow through the coronary artery can keep heart muscle cells from dying. Large randomized clinical trials have shown that if aspirin is used immediately with an acute heart attack, the mortality rate after five weeks is reduced by 23 percent. This is why chewing and swallowing an aspirin is usually one of the first things you will be asked to do when you arrive in the emergency room with a suspected MI. But time is of the essence—minutes count. So if you think you might be having a heart attack, most experts now advise patients not to wait until they get medical help—chew and swallow an aspirin as soon as you are concerned enough to call the paramedics. In this way, you can begin therapy immediately. The current recommendation for people who may be having a heart attack is to chew and swallow one non-coated adult aspirin (325 mg) as soon as possible. 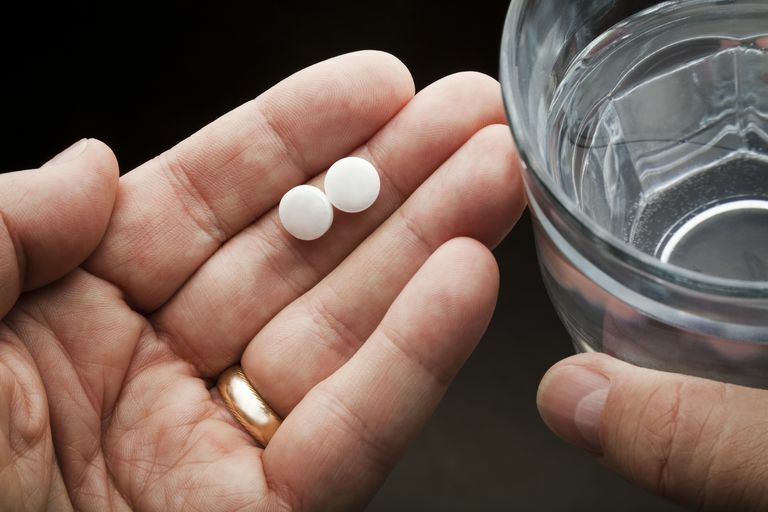 Chewing or crushing the aspirin gets it into your bloodstream more quickly—within four to five minutes—and researchers have measured a significant effect on platelets within that short period of time. Swallowing a whole aspirin with water, as you normally would, takes 10 to 12 minutes to achieve the same effect. This time difference may seem small, but, once again, minutes count when your heart is at risk. Wright RS, Anderson JL, Adams CD, et al. 2011 ACCF/AHA Focused Update of the Guidelines for the Management of Patients With Unstable Angina/ Non-ST-Elevation Myocardial Infarction (Updating the 2007 Guideline): a report of the American College of Cardiology Foundation/American Heart Association Task Force on Practice Guidelines. Circulation 2011; 123:2022.